My friend Ron introduced me to Julie, a waitress at the Blue Cactus restaurant in Downtown Columbia, SC. (It’s a small family business. Great food.) She had pulled her shoulder, so she needed a replacement on her team. Ron suggested me, and everyone was happy. It all got turned around, though. On Race Day, one of the other team members called in sick, so Julie and I wound up on the team together. We did our best to go easy on that shoulder, and to help her through the obstacles where needed. Sadly, the organizers overbooked the event. (Over 3500 teams, each with four members.) They were so focused on how many teams they could shuffle through that they forgot to think about parking. Yeah, that’s right. Crazy as it sounds, people don’t just teleport to the site. They actually have to drive there. This halted line of cars went all the way up the exit, all the way to the main road, and all the way to the parking lot. The result of taking in all the money you can grab is a gigantic traffic jam. 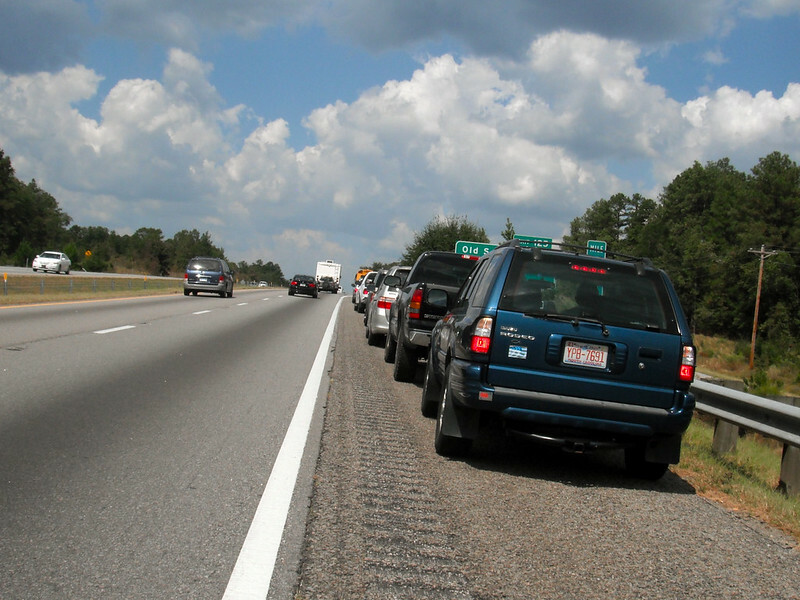 The SC Highway Patrol was actually blocking Exit 125, forcing everyone to drive several miles past it to turn around the next exit. No one was told about this ahead of time. No one knew why the police had the exit blocked. No one had any idea that a simple 20-mile trip from Columbia to Gaston would take over three hours. The line of cars shown on the left was matched at Exit 129. So basically, we all had to drive four miles past the exit, wait in line while cops directed us to turn around, drive four miles back and then wait again to get off at the correct exit. It was a mess, and there’s no excuse. 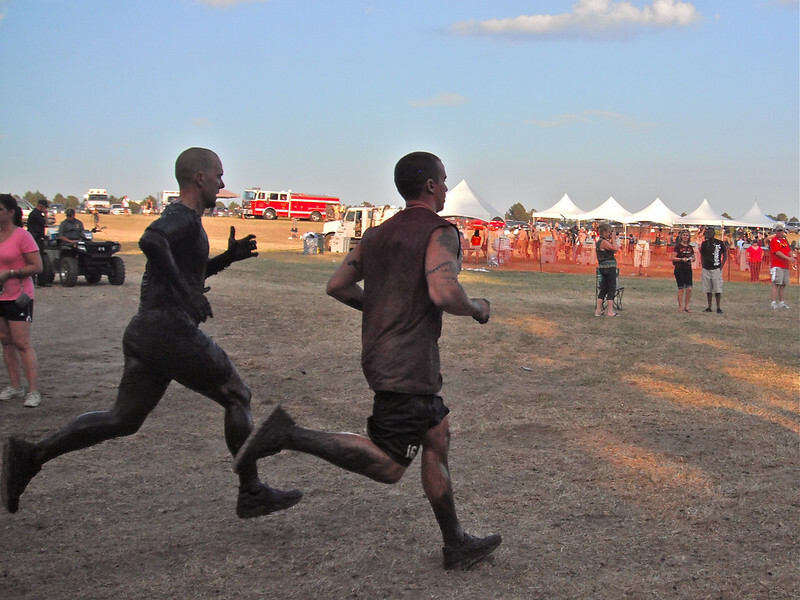 It may have been a new site, but it wasn’t the first Mud Run. The organizers should have known better. Living in New England kind of softened up my car maintenance skills. Of course the Winter is a big deal, but I walked and took the train so much that I stopped paying attention to things like oil changes and gauges. So imagine my surprise when I noticed that my engine temperature was through the roof! I was just barely into the exit, so I pulled to the left and shut down the engine. When things are resolved, I could choose to take the exit or drive on. I had no water in the car, so I took a towel and loosened the coolant cap to relieve some of the steam pressure. With that done, I sealed it back up and ran up the exit. We just drove across to continue West on I-26 and picked up our water and gasoline. Then we went through the whole mess again. After he dropped me off, I put in the water and watched my gauges for a little while. Everything looked good and the exit had settled down for the moment, so I took the exit. I didn’t bother trying to get to the parking lot itself. I just parked on the main road as many others were doing. It was a bit of a walk, but I got in and found Julie. Once inside, things were a lot calmer. I suppose the insanity had taken the fight out of me, but I missed many of the costumes that were walking around. Seriously, I missed the lot of them. I guess it’s because of the nature of the course. I mean, who would expect a guy to wear a fancy Wolverine costume for something like this? Why ruin it? But at least I was inside. Eventually the rest of the group arrived and we had full attendance for Team Candiru. (I’m not explaining that, you’ll have to Google it.) It was well past our official starting time, but due to the traffic that was no longer an issue. People were allowed to run whenever their team was on-site and ready. Julie’s daughters were nice enough to watch our stuff while we went to the Starting Line. There were 32 obstacles in all. (Well, 33 if you count the drive.) All the old favorites were there, from the over-and-under logs to that big flat wall everyone has to clear. Most of it was the same as I had remembered from the old site, although some obstacles appeared more than once. The only really stupid obstacle was a huge mud pit that people were supposed to crawl through somehow. It looked like crazy people rolling around in a pig pen. The stuff was waist-deep and the only way to navigate it was to roll across the top. We were told that there was no penalty for this one, so the rest of the team wanted to go around it. I agreed until I saw Julie get stuck. She just wanted to bypass the whole mess, but somehow she wound thigh-deep in mega-mud. I actually had to reach down and grab her shoes to make sure they came up with her feet. They were like little mud scoops, dragging everything up with them as she lifted her legs. It was a real chore for her to escape it all. I’m a curious guy. Since I was already kind of into the mess, I figured I would at least have a go at pushing across. Bad idea, of course. Really bad idea. It was nearly impossible to move anywhere. People were pushing on each other, and there were shoes under the surface every time I reached out. It would have taken forever to cross, and it was already getting late in the afternoon. Since there was no penalty for skipping it, I climbed out (with help) and went around. But over all, I was pretty happy with the course. Just like last time, the other participants were fun and nice, and quick to help each other. We all had a great time. That’s me on the left! And I passed that guy just before the Finish Line! 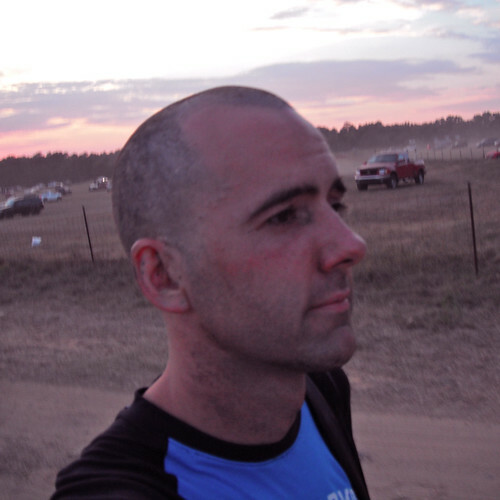 Eventually the team parted ways, and I found myself waiting in line at the site showers. I had intentionally worn older shoes, so I didn’t hesitate to pull off the tape and toss them into the growing pile alongside the line. I still had my backpack, courtesy of Julie’s daughter, so I towels and a change of clothes. 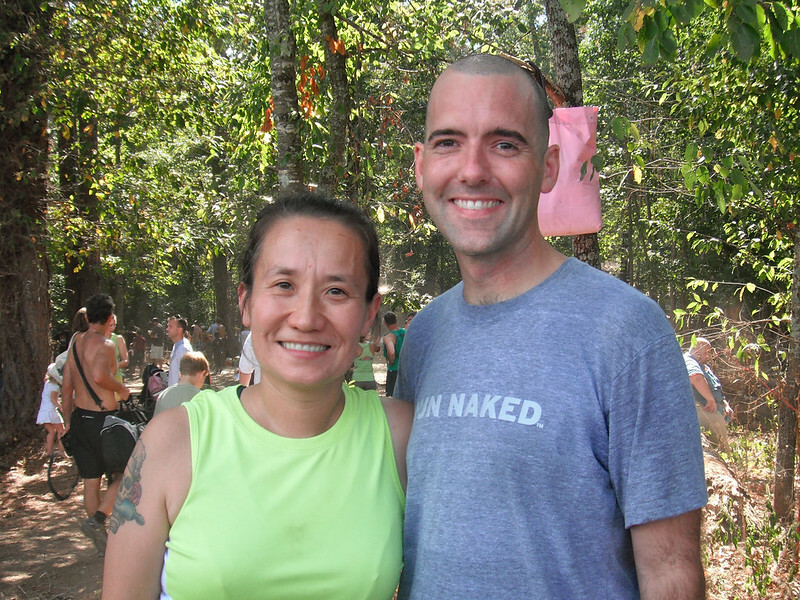 As I left the showers for the Men’s Changing Tent, I realized that my Run Naked shirt was a loss. My shorts had gotten some water in the showers, but I had taken off the shirt and it was still covered in a seemingly endless supply of slimy mud. I didn’t think I could clean it enough to feel safe stuffing it into my backpack, so I dumped it into a special trash can they had rolled into the tent. I guess they clean the stuff up and donate it or something. I’ll miss the shirt. It was a gift from my friend Amy. But then, I guess if I liked it so much I should support the company by ordering another one. Over all, The Mud Run was everything it should have been. The course was great and I was filled with a sense of accomplishment afterward. I was also inspired to work on my upper body so I won’t need so much help on certain obstacles next time. If the organizers can wake up and sort things our properly next year, I’d be happy to do this event again. But just in case, we’re all planning to register on the first day so we can run early in the morning. Im so sorry to hear of all the negative things that happened to you on saturday. I am glad you finally got to run with your team and experience the whole feeling of accomplishment. I work at Providence Hospital (Columbia SC) in the Lab and we had two teams in the race. This was the first mud run for all of us. It was amazing! It was great working as a team. We had a run time of 7:29 am. We were told to arrive 1hr early of run time. We actually arrived there around 6am. Even at that time you could start to see the makings of a “cluster” mess. The cops were directing one car at a time,with only one entrance. There were a lot of people there already. The key is to get the earliest time possible. Your right my team and I said the worst part of the whole thing was the “Mud Pit”…. we now say the team would of come out better staying on the side lines and taking the “3 minute” penalty. It took us atleast 5 to almost 10 minutes just to try to get through it. But all & all we had a blast! We all decided were coming back for more next year! I was so siked I told my team about another race in March being held in Florence SC. Not a mud run but another “team challenge”. Check it out…www.eggplantevents.com (Palmetto State O-run team challenge). It was already stacking up at that time of day? I had hoped that the early people had an easier time than we did. At least they have another year to figure out how to run things. Thanks for that link! There are several races there that I had no idea about. I gotta start keeping a race calendar if I’m going to do Columbia and Charleston!